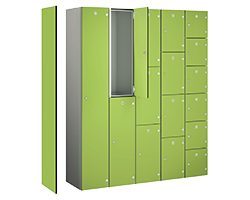 CS Storage have a huge range of lockers of all types from a wide variety of materials - steel, plastic, mesh and more. We also provide lockers for all types of environments and organisation from the public sector through to small and large businesses. Here you can find many 2 door lockers so if you are locking for a locker with two compartments, you should find what you need here. If you can't find the locker you are looking for, we are sure to be able to source it for you at a fantastic price and with excellent service so please contact us by phone - 01772 322634 or by email and we will do our utmost to offer you a great deal. For schools,councils, colleges, M.O.D, and public sector organisations, we can offer 30 day credit accounts - simply complete your order online - choose purchase order as the payment method and we will do the rest.